"Hold on . . . you're surrounded by about a zillion blood-sucking, brain-eating, friggin' walking-dead zombies and you don't like to be around guns?" 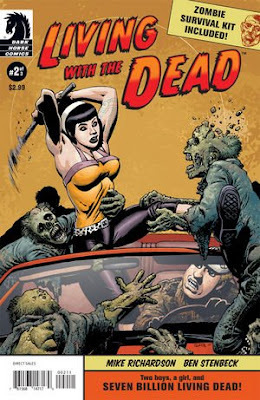 - Betty Davis, to Whip and Straw, fellow survivors in the aftermath of the zombie apocalypse, in Living with the Dead #2 (Dark Horse Comics, Issue Date: November 2007). 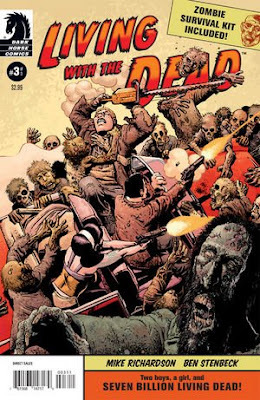 Published by Dark Horse Comics, the series is written by Mike Richardson, with art by Ben Stenbeck, letters by Clem Robins, cover art by Richard Corben, cover color by Dave Stewart, design by Kristal Hennes, and edited by Scott Allie, the three issue Living with the Dead limited series is yet another attempt by an indie comic publisher to milk the zombie genre. So often has this well been revisited that its novelty not only wanes, but congeals. In perpetrating this narrative, writer Richardson tells the tale of Whip and Straw, two lunkheads whose prospects in life were no doubt elevated by the end of the world. 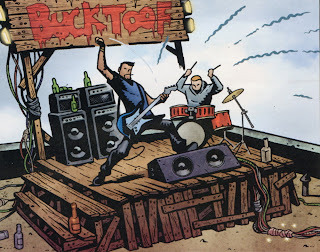 In their post-apocalyptic metropolis, they visit the local mall and take to their city rooftop to perform as Bucktoof, the last remaining band in the city. (Interestingly, Whip and Straw's names are not provided at all in the first issue of the series, a careless omission indeed in the grand scheme of things.). Warning: Dark Horse Comics takes no responsibility, and makes no guarantee that this mask will save you from an attack of the living dead. Furthermore, wearing a mask does not guarantee safe passage through zombie-infested areas. Please refer to the actions a to the actions taken by the characters in this book, and practice moaning the words "Brain and "Flesh" in public areas. 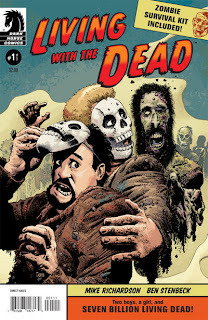 Dark Horse Comics takes no responsibility for the looks you will receive for utilizing your Living Dead Disguise. The issue that is to come between these two best friends is not unfamiliar. In establishing this conflict, Richardson recycles a plot not from comics but from sitcoms: Whip and Straw begin to stab each other in the back over issues large and small upon the appearance of Betty Davis, a woman they both come to admire. She is a tattooed hipster and the last remaining female in the city, leading to the tagline of the series: "Two boys, a girl, and seven billion living dead!" Davis is feisty and a bit self absorbed, but she captivates the two male would-be heroes, who rescue her from the mall in which they find her and then attempt to woo her. The two risk their friendship - and each other's lives - just to be in the same room with her. Ultimately, though, upon finally realizing they she is a threat to their cozy existence, they toss her from the rooftop into a pack of zombies, thereby resolving the issue of the day. 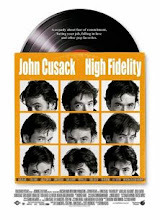 The aforementioned comparison to a sitcom is apt not just with respect to the tone of the series, but also its scope. This is not an epic tale of survival, as is The Walking Dead, the fine series by the famed Robert Kirkman. Of course, this series does not aspire to be a such, but its tired premise and overly familiar romantic sub plot are derivative of prior narratives which themselves were derivative of what came before them, as well. The question: To invest the time, energy, and effort required of a three issue comic series these days, why refrain from an attempt at something fearless and inventive? Dark Horse Comics provides no answer to that question.